This year, BASF is presenting not only its thermosetting materials at "Composites Europe" trade fair being held in Stuttgart from September 17 to 19, 2013, but also its new thermoplastic composites with continuous fiber reinforcement developed specifically for lightweight applications for the automotive industry. In addition, polyurethane technology news for wind turbine applications will be exhibited by BASF in Hall 4, Booth B26. For the first time at Composites Europe, BASF is exhibiting a pultruded part manufactured from Elastocoat® C6226-100 polyurethane resin. Together with its partner Fiberline Composites A/S in Denmark, BASF developed this resin for production of pultruded rods for secure attachment of the rotor blade root to the nacelle. The continuous pultrusion process permits better alignment of the fibers as well as in-line integration of a metal bushing, so that high and constant product quality is assured. The polyurethane resin ensures improved adhesion to the metal bushing and also to the epoxy infusion resin. The pre-manufactured part allows to forego the classical concept of drilling sideway holes to fix the bushings. It thus makes possible a reduction of both blade root and hub diameter, resulting in substantial material savings. BASF is also showing a sandwich panel with glass fiber-reinforced laminate based on the Baxxodur epoxy resin system and a foam core made from a new, especially fatigue-resistant version of Elastolit® polyurethane foam. For this, the team at BASF Polyurethanes GmbH in Lemförde modified the properties of the previously rather brittle PU foam for use in the sandwich – a four-point bending test validated the significantly improved dynamic properties and high impact strength. 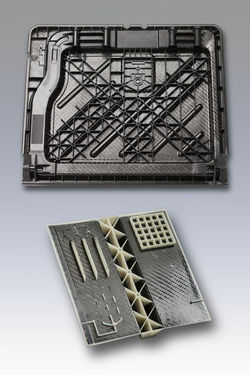 This PU molded foam system allows producing complex geometry foams in a single shot and as such complements the new BASF Kerdyn® PET foam. On display for the first time at Composites Europe: the cross-section of a wind turbine rotor incorporating the wide range of BASF products for rotor blade production. The glass fibers are encapsulated in Baxxodur resin, which is ideal for use in vacuum infusion. The Kerdyn PET structural foam provides good mechanical Properties to ensure the required stability of the blade's interior. The outer finish of the rotor cross-section employs the RELEST® gelcoat system and the semi-structural Elastan® polyurethane adhesive also belongs to the BASF product line.